Background: Laryngeal mask airway (LMA) is an useful alternative to endotracheal tube for airway management. The risk of life-threatening adverse respiratory events during its use is rare, but we need to know about the risk-adjusted prediction of its insertion failure requiring rescue tracheal intubation and its impact on patient outcome. Materials and Methods: Five hundred patients; 6 months to 12-year-old, American Society of Anesthesiologists I and II scheduled to undergo elective surgical procedures that require general anesthesia were included in this study. LMA was inserted after induction of anesthesia. The insertion conditions, intra, and postoperative events were recorded. Our primary outcome variable was trial success from the first time. Results: We recorded 426 cases (85.2%) of first trial success with clear airway compared to 46 case (9.2%) of second trial success (P ≤ 0.001). Predictors of failure of first attempt of LMA insertion include abnormal airway anatomy (91%), body weight <16 kg and age below 5 years (44%), the use of LMA size of 1 and 1.5 (3.8%), the intraoperative lateral position (3.8%). Conclusion: The data obtained from this study support the use of the LMA as a reliable pediatric supraglottic airway device, demonstrating relatively low failure rates. Predictors of LMA failure in the pediatric surgical population should be independently considered. Trial Registration: The study is registered in the Australian and New Zealand clinical trial registry with the allocated trial number: ACTRN12614000994684. Web address of trial: http://www.ANZCTR.org.au/A CTRN12614000994684.aspx. Since its introduction to the practice of anesthesia in the early 1980s, , the laryngeal mask airway (LMA) has gained wide spread popularity as a good and trustable substitute to the endotracheal tube in specific situations regarding the nature of the airway, the type of surgery, and the patient's characteristics. The development of small sized laryngeal masks allowed its use in anesthesia for the pediatric surgical patients. These patients have different airway characteristics such as high larynx, large tongue, funnel shaped laryngeal cartilaginous skeleton, lack of teeth, and short neck which makes the possibility of difficult intubation higher than in adult patients. Added to this is the rapid development of hypoxemia during trials of intubation in a rather difficult airway of few kilograms infant. Its use is also not without complications and risk as its airway protection is less tight than the cuffed endotracheal tube. Its use is associated with higher incidence of gastric insufflations and respiratory obstruction resulting in hypoxemia. This is why the fourth National Audit Project of the Royal College of Anesthetists and Difficult Airway Society,  had reviewed complications of airway management morbidity and mortality such as brain damage, emergency surgical airway, unanticipated intensive care unit admission, or prolongation of Intensive Care Unit stay. They found that the estimated incidence of these life-threatening complications with supraglottic airway device use for general anesthesia was 1 in 46,174. In comparison, adverse respiratory events, such as significant airway obstruction and laryngospasm during LMA Classic™ use, were seen more frequently, with reported rates of 0.15-7%. As with the endotracheal tube; insertion of the LMA became a basic skill that the junior staff should be well trained in its use and dealing with its possible problems during anesthesia. We performed this study to investigate the incidence of difficult and failed insertion of the LMA in pediatric patients compared with the relative ease of its insertion to judge the efficiency of our residents and junior staff in dealing with this supraglottic airway device aiming at avoiding risk factors that lead to failed insertion and ensuring more patient safety. This cohort observational study was performed in the Department of Anesthesia of Qena University Hospital, South Valley University along the year 2014. The study protocol was approved by Qena Faculty of Medicine Ethics Committee. Parents of the patients were informed that the LMA will be used instead of endotracheal tube for airway management during anesthesia, and they gave consent to the anesthetic and surgical procedures altogether as use of the LMA is neither considered experimental nor harmful in our department as well as in other medical centers. The study is registered in the Australian and New Zealand Clinical Trial Registry with the allocated trial number: ACTRN12614000994684.Web address of trial: http://www.ANZCTR.org.au/A CTRN12614000994684.aspx. Five hundred patients 6 months to 12-year-old, American Society of Anesthesiologists I and II scheduled to undergo elective surgical procedures that require general anesthesia were included in this study. Exclusion criteria included surgery requiring endotracheal tube placement and controlled ventilation, emergency surgery to patients with potentially full stomach or insufficiently fasted, morbid obesity, recent upper respiratory tract infection (within 48 h and not resolved), and gastro esophageal reflux. Anesthetic management was standardized to all patients. Children below 5-6 years of age were usually anesthetized by inhalational induction with sevoflurane in oxygen by face mask for sufficient time. Adequate depth of anesthesia was judged by the lack of motor response to jaw thrust. LMA (classic), (deflated and lubricated) is inserted and connected to the anesthesia breathing circuit. Intravenous (I.V.) line is established for fluids and drugs administration. The patients were monitored for SpO 2 , EtCO 2 , electrocardiography, and skin temperature. I.V. induction with propofol 1% 1-2 mg/kg plus 1-2 μg/kg fentanyl and atropine 0.04 mg/kg was reserved for older children who are co-operative with the attending anesthesiologist. Laryngeal masks sizes of 1-1.5 for 5-10 kg weight and 2-3 for 20-40 kg weight were used as appropriate. Maintenance of anesthesia was done by sevoflurane in oxygen. No neuromuscular blocking drugs were used. The LMA was removed at the end of the surgical procedure under a deep plane of anesthesia. We recorded (in a separate sheet given to every attending anesthesiologist who will insert the LMA) the patient's age, weight, size of LMA, type of surgical procedure, and time of surgery. We also recorded the number of attempts done before successful insertion of the LMA. The successful insertion was confirmed by adequate ventilation (SpO 2 ≥92%), regular bag movement synchronous with chest movement, expired tidal volume of at least 7 ml/kg and no evidence of respiratory obstruction. During the maintenance of anesthesia the quality of airway and any manipulation of the LMA were recorded. Postoperatively we assessed our patients for persistent cough, sore throat, dysphonia, dysphagia, stridor, regurgitation, and laryngospasm. The presence of blood on the LMA was also noted and recorded in the LMA sheet. Failure of the LMA insertion is defined as the inability to get the correct placement of the device within three attempts or dislodgment of the LMA after insertion that necessitates removal of the LMA and endotracheal tube placement. Inadequate ventilation was considered as a sign of failure in the form of obstructed chest movement and desaturation (SpO 2 ≤92 %). For purposes of statistical analysis, age was dichotomized into age <5 years and age 5-12 years. Weight was also dichotomized into <16 kg and above 16 kg. The same was done for gender, patient position, surgery time, anesthesiologist's experience. All analyzes were performed using SPSS version 17.0 (SPSS Inc., Chicago, IL, USA). Basic descriptive statistics was calculated for all data-field variables listed in [Table 1] [Table 2] [Table 3] [Table 4]. Univariate analysis was conducted for each variable, with P values calculated using Pearson Chi-square or Fisher exact tests for categorical variables and Student's t-tests for continuous variables. All variables considered to be significant (P < 0.05) were established as independent predictors. Odds ratios were then used to assess each variable for effect size, comparing the chance of a failed first trial of insertion of the laryngeal mask among patients with and without each risk factor. Sample size calculation was done assuming that our primary outcome variable is the trial success of LMA insertion from the 1 st time. We found that 478 (completed to 500 cases) sufficient for 80% power to detect a 2% failure rate of LMA insertion with P < 0.05 as significant. We enrolled 500 pediatric patients admitted to Qena University Hospital for different surgical procedures under general anesthesia using the LMA. 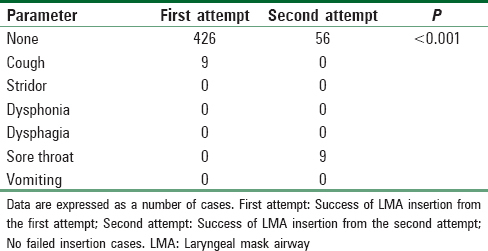 We did not record any cases of failed LMA insertion in terms of complete airway obstruction after trial insertion, so we compared the success of trial of insertion from the first attempt with the second attempt. We found statistically significant difference between groups regarding age above versus below 5 years, body weight <16 kg, male/female number of cases, and history of upper respiratory tract infection with P = 0.001 [Table 1]. 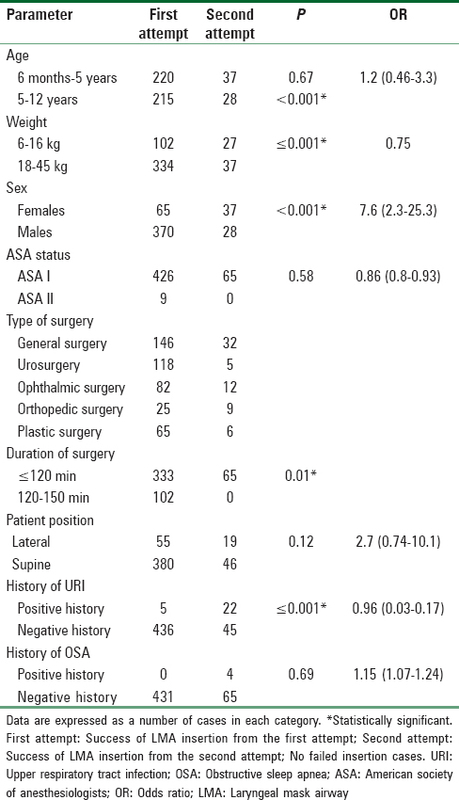 Regarding the duration of surgery statistically significant difference was recorded between first and second attempts for the duration more than 120 min; as P = 0.01 [Table 1]. The method of induction of anesthesia showed that the I.V. induction was associated with higher incidence of a second attempt than the inhalational method though no statistically significant difference was found; P = 0.78 [Table 2]. The LMA size 2 was the most common size used with the higher rate of success of insertion from the first attempt [Table 2]. The airway after insertion was patent and clear in 426 (85.2%) cases. We did not record any case of complete obstruction after insertion [Table 2]. We recorded 9 (1.8%) cases of desaturation, 18 (3.6%), and 19 (3.8%) cases in whom bucking occurred after first and second attempts of insertion respectively, but the majority of cases 417 (83.4%) passed without intraoperative complications; P = 0.001 [Table 3]. Postoperatively: Nine (1.85) cases of a cough and 9 (1.8%) cases of a sore throat were recorded, and the rest of the study patients passed smoothly; P = 0.001 [Table 4]. We found eight risk factors predicting LMA insertion from the second attempt and requiring caution during management of pediatric LMA insertion. These factors include abnormal anatomy (91%), I.V. induction of anesthesia (59.4%), junior anesthetist (61%), lateral position of the child (3.8%), age group below 5 years (7.4%), weight <16 kg (5.5 %), LMA size 2 (5.6%), and the positive history of upper respiratory infection (4.4%) [Figure 1]. This study was performed as a part of a program of self-evaluation of training of the anesthesiologists working in our department. Five hundred pediatric patients admitted to our hospital in the year 2014 for different surgical procedures were enrolled in the study. The incidence of failed insertion of LMA was 0. 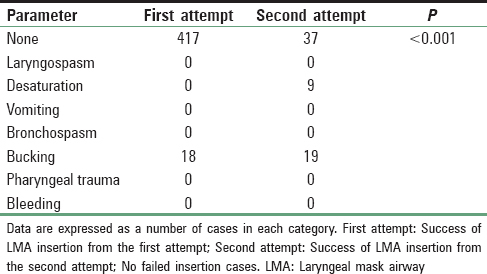 We reported 426 cases (85.2%) of clear airway after LMA insertion from the first attempt and 46 cases (9.2%) of clear airway after the second attempt with overall percent of success of 94.4%. 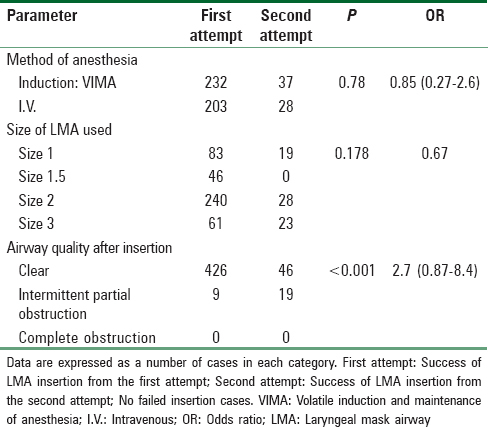 Intermittent partial airway obstruction occurred in1.8% of cases after LMA insertion from the first attempt and 3.8% of cases after the second trial without a need to remove or replace the mask with an endotracheal tube. The low incidence of pediatric laryngeal mask insertion failure in our study is consistent with prior literature, confirming its use as an airway management device during general anesthesia. ,,, Despite this, the serious nature of adverse airway events is a risk the anesthesiologists must put in mind, and factors associated with increased failure risk are identified by our study. As we did not record cases of failed insertion we compared the success of trial insertion from the first attempt with the second trial of insertion. We recorded 8 predictors of failure of insertion from the first trial [Figure 1] on top comes the airway anatomical variations between children as 91% of cases with airway abnormality were associated with failed first trial. The pediatric airway already possesses unique features that add difficulty to airway device insertion such as large tongue, short neck, high larynx, poor dentition, and if this is combined with recent (within 2 weeks) history of upper respiratory tract infection (irritable airway) then the chance of insertion from the first attempt was poor (1% in our study). Body weight and patient's age represent important predictors of success of LMA insertion in children. 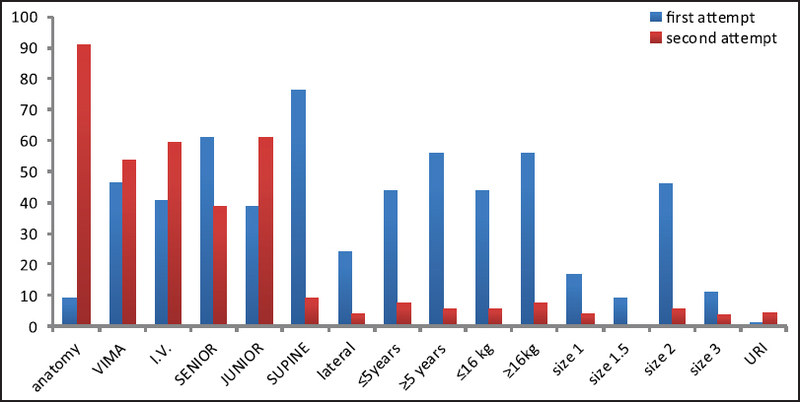 We found body weight <16 kg which is usually associated with age <5 years are risk factors for failure of first trial of LMA insertion and only 44% of cases of smaller children in whom we could insert LMA from the first trial. This is in agree with previous studies that found younger ages to present increased risk of airway complications of general anesthesia, ,, and increased risk of laryngeal mask failure in specific procedural groups. The study done by Mathis et al. in 2013,  reported that: (Although multivariate analysis did not demonstrate age <2 years to be independently associated with laryngeal mask failure, univariate analysis demonstrated an association with increased failure risk. Our data suggest the need for heightened concern when considering laryngeal masks for younger children). Related to patient's age and weight is the size of LMA used. We found smaller laryngeal mask sizes (size 1.5 is the least [9% first trial]) and sizes not weight-matched to manufacturer recommendations were more frequently associated with first trial failure. These results must also be interpreted with caution, however, as variations in success were observed across laryngeal mask sizes, and laryngeal masks which were not size-weight matched may have been the result of inappropriate choice of the size. This addresses the effect of the attending anesthesiologist's experience as we found over 60% of successful first trial insertion was with senior anesthesiologists. The senior anesthesiologist can decide the suitable method of induction of anesthesia (I.V. or volatile induction), the suitable LMA size, and the proper time of insertion of the LMA. Our study was performed to assess the efficacy of training of our residents during management of the difficult airway. The situation of the difficult airway requires a trial of LMA insertion as an alternative to endotracheal intubation. The attending anesthesiologist must be able to predict the ease of LMA insertion and save time if he was not sure that the LMA will be inserted easily and safely, otherwise he should search for other alternative that is why we designed this cohort to test the ability to predict ease of laryngeal mask airway insertion. This study has several limitations: First we did not put guidelines for choice of LMA size and replacement of LMA with an endotracheal tube as this was left for the attending anesthesiologist who may be junior or senior staff. Second we did not assess and standardize the depth of anesthesia before insertion of the LMA. Lastly the intra and postoperative complications though rare were not evaluated for true correlation with the trial insertion. We found a first trial of LMA insertion in pediatric surgical patients to be safe and easy in over 90% of our patients. The failure rate of first insertion trial though low but must be considered especially in difficult airway situations. Predictors of failure of first trial insertion are abnormal airway anatomy, age <5 years, weight <16 kg, the lateral position, and the use of LMA size of 1 and 1.5. South Valley University, Qena, Egypt. Brain AI. The laryngeal mask - A new concept in airway management. Br J Anaesth 1983;55:801-5. Montazari K, Naghibi K, Hashemi SJ. Comparison of hemodynamic changes after insertion of laryngeal mask airway, racemask, and endotracheal intubation. Acta Med Iran 2004;42:437-40. Bordet F, Allaouchiche B, Lansiaux S, Combet S, Pouyau A, Taylor P, et al. Risk factors for airway complications during general Anesthesia in paediatric patients. Paediatr Anaesth 2002;12:762-9. Cook TM, Woodall N, Frerk C, Fourth National Audit Project. Major complications of airway management in the UK: Results of the Fourth National Audit Project of the Royal College of Anaesthetists and the Difficult Airway Society. Part 1: Anesthesia. Br J Anaesth 2011;106: 617-31. Ramachandran SK, Mathis MR, Tremper KK, Shanks AM, Kheterpal S. Predictors and clinical outcomes from failed Laryngeal Mask Airway Unique™: A study of 15,795 patients. Anesthesiology 2012;116:1217-26. Fuentes-García VE, Morales-Pérez E, Ramírez-Mora JC, Alarcòn-Almanza JM, Moyao-García D, Blanco-Rodríguez G, et al. A randomized trial comparing laryngeal mask airway to endotracheal tube in children undergoing upper gastrointestinal endoscopy. Acta Biomed 2006;77:90-4. Goldmann K, Malik A, Hechtfischer C. Clinical use of the ProSeal™ laryngeal mask in infants, children and adolescents: Prospective observational survey. Anaesthesist 2011;60:729-34. Tait AR, Voepel-Lewis T, Burke C, Kostrzewa A, Lewis I. Incidence and risk factors for perioperative adverse respiratory events in children who are obese. Anesthesiology 2008;108:375-80.
von Ungern-Sternberg BS, Boda K, Chambers NA, Rebmann C, Johnson C, Sly PD, et al. Risk assessment for respiratory complications in paediatric Anesthesia: A prospective cohort study. Lancet 2010;376:773-83. Lalwani K, Richins S, Aliason I, Milczuk H, Fu R. The laryngeal mask airway for pediatric adenotonsillectomy: Predictors of failure and complications. Int J Pediatr Otorhinolaryngol 2013;77:25-8. Mathis MR, Haydar B, Taylor EL, Morris M, Malviya SV, Christensen RE, et al. Failure of the Laryngeal Mask Airway Unique™ and Classic™ in the pediatric surgical patient: A study of clinical predictors and outcomes. Anesthesiology 2013;119:1284-95. Wilson MN, Long LS, Ved S, Harley E. Younger pediatric adenotonsillar surgical patients exhibit more complications at mouth gag insertion with LMA use. Int J Pediatr Otorhinolaryngol 2009;73:1173.